Objectives: To evaluate the efficacy of placing spreader grafts via an endonasal approach and to examine the immediate and long-term functional results. Methods: Aretrospective review was performed of 41 consecutive cases involving adult patients who underwent nasal valve reconstruction. Medical history and clinical examination established the cause of nasal obstruction, with internal valve dysfunction confirmed through endoscopic evaluation and the modified Cottle maneuver. Surgical correction involved a spreader graft harvested from autologous cartilage and placed endonasally. Comparison and evaluation of preoperative vs postoperative symptom severity, photographs, and patient self-assessment were used to quantify the results of the operation. patients (66%) were Asian, 12 (29%) were white, and 2 (5%) were Hispanic. Thirty of 41 patients (73%) expressed strong concern regarding the presence of a transcolumellar scar. Among our patients with confirmed internal nasal valve dysfunction, 25 (61%) reported significant improvement, 15 (37%) noted some improvement, and 1 (2%) described no change; none reported a worsening of symptoms. Conclusions: The endonasal approach to placement of spreader grafts for nasal valve reconstruction is effective at relieving nasal obstruction due to internal nasal valve dysfunction. Paramount to the success of the procedure is appropriate patient selection and careful attention to surgical technique. FOR AN INVISCID FLOW, AN increase in the speed of the fluid occurs simultaneously with a decrease in pressure or a decrease in the fluid’s potential, as set forth by Bernoulli’s principle. Consequently, within a fluid flowing horizontally, the highest speed occurs where the pressure is lowest, and the lowest speed occurs where the pressure is highest. When fluid dynamics is applied to nasal airflow, particular attention is directed to the narrowest portion of the nasal cavity and consequently the area of greatest airway resistance: the internal nasal valve. Since his original article, the technique has been widely adopted for a variety of functional and cosmetic indications, including correction of internal nasal valve collapse; bridging a long, narrow middle vault in patients with short nasal bones; correcting lack of dorsal support of the lateral nasal walls; widening the middle third of the nose; straightening or stabilization of a high dorsally deviated septum; creating straight dorsal aesthetic lines; and lengthening a short nose as a caudal extension graft. The open rhinoplasty approach for the placement of spreader grafts is perhaps more commonly used than the endonasal approach because it has the advantages of improved visualization and potentially more accurate fixation of the cartilage grafts. Multiple iterations of the endonasal approach have also been delineated, consisting primarily of variations of methods to secure the graft in place by a tight subperichondrial pocket, adhesives, or sutures. We present herein our experience with a series of patients with internal nasal valve dysfunction corrected by endonasal spreader graft placement. We performed a retrospective medical record–based review on a series of 41 consecutive patientswhohad undergone spreader graft placement via an endonasal approach for correction of internal nasal valve collapse during a 5-year period. Medical history and clinical examination established the cause of nasal obstruction, with internal nasal valve dysfunction confirmed through endoscopic evaluation and the modified Cottle maneuver. Rigid nasal endoscopy revealed narrowing and collapse of the nasal valve area, whereas improvement in nasal patency was demonstrated by superolateral retraction of the ULC, into the anticipated postoperative configuration, with a cotton-tipped applicator. Patients refractory to maximal medical management of nasal obstruction and with evidence of internal nasal valve deformity were offered reconstruction with spreader graft placement. Surgical procedures were all performed by the senior author (A.J.). Preoperative symptom severity, photographs, and physical examination findings were reviewed and compared with postoperative results. A patient questionnaire and the postoperative appearance on physical examination determined the degree of functional change. Symptom severity was graded subjectively by patient self-assessment on a scale comprising significant improvement, moderate improvement, no improvement, or worsening of symptoms. Assessments occurred on average 12 months after surgery. Functional change was also analyzed on the basis of appearance during postoperative physical examination of the nasal airway, which in every case included endoscopic examination of the nasal valve. Note was made of anatomic findings and reconstructive publications at the time of surgery. After infiltration of lidocaine hydrochloride, 1%, with 1:100 000 epinephrine into the submucoperichondreal plane along the septum, the internal nasal valve area was approached via a transfixion incision combined with an intercartilaginous incision. Blunt dissection with a Cottle elevator began along the dorsal septum and proceeded posterior to the osseocartilaginous junction. The skin envelope overlying the nasal dorsum was then elevated in a supraperichondreal/subperiosteal plane with a combination of sharp scissor dissection and blunt dissection with a periosteal elevator, exposing and isolating the ULC. The junction of the ULC with the cartilaginous septum was then sharply divided with a scalpel (No. 15) (Figure 1). Autologous cartilage, from either the nasal septum or the auricular conchal bowl, was used to fashion all spreader grafts. Figure 1. Technique. A, Separation of the upper lateral cartilage from the septum. B, Placement of the spreader graft between the upper lateral cartilage and the septum. Figure 2. Suture stabilization of the spreader graft. Grafts were then placed between the divided ULC and septum under direct visualization and suture stabilized with a transseptal mattress of monofilament synthetic absorbable interrupted sutures (4-0 PDS; Ethicon) (Figure 2). Our study included 22 women and 19 men with a mean age (range) of 32 (19-56) years. Nasal valve reconstruction with spreader graft placement was performed on a total of 41 sides. Eighteen patients had undergone prior nasal surgery, and 23 patients reported previous nasal trauma. Twenty-seven patients (66%) were Asian, 12 (29%) were white, and 2 (5%) were Hispanic (Figure 3). All the patients included in this study had a minimum follow-up of 1 year (mean [range], 1 year 8 months [1-5 years]) and were examined multiple times during their postoperative course by traditional clinical examination and with endoscopic evaluation. Figure 3. Number of patients undergoing endonasal placement of spreader grafts, by race/ethnicity. Figure 4. Functional results determined by patient self-assessment by symptom (A) and procedure (B). SG indicates spreader graft; SMR, septoplasty; and T, turbinoplasty. Thirty of 41 patients (73%) expressed enough concern regarding the presence of a transcolumellar scar that, had there been even a possibility of one, however transient or subtle, they would have deferred surgery. The reasons patients cited for their aversion to a possible transcolumellar scar included personal history of poor scar formation, negative social and cultural responses to a visible scar revealing plastic surgery, and relative increased edema and recovery time vs an endonasal approach. Internal nasal valve dysfunction was identified on the basis of medical history and clinical examination and was present on 1 side in 41 patients. In this group, 32 patients were also identified as having septal deviation, and 23 patients were noted to have turbinate hypertrophy. Nasal valve obstruction was addressed with the placement of a spreader graft in 6 patients, with a spreader graft and septoplasty in 12 patients, with a spreader graft and turbinate reduction in 3 patients, andwith a spreader graft with septoplasty and turbinate reduction in 20 patients. Septal cartilage was used in 39 patients and auricular cartilage in 2 patients. Patients were asked to compare their nasal obstructive symptoms with their preoperative state on each side. Twenty-five patients (61%) reported significant improvement, 15 patients (37%) noted some improvement, and 1 patient (2%) described no change; none reported a worsening of symptoms (Figure 4A). No significant differences were noted in functional results between the Asian patients and the rest of the study group. A greater percentage of patients undergoing adjunctive nasal procedures reported significant improvement in nasal obstructive symptoms relative to patients undergoing spreader graft placement alone (Figure 4B). Clinical examination and evaluation of postoperative photographs revealed increased resistance to collapse of the nasal valve area and increased width of the middle third of the nose (Figure 5). As the area of greatest airflow resistance in the nasal cavity, the internal nasal valve has drawn considerable attention and study. Even before a widely accepted method for reconstructing the nasal valve had been described, many realized the importance of preserving the nasal valve to maintain airflow. Clinical and anatomic studies of numerous publications designed to restore nasal patency have provided valuable insight into the static and dynamic role of this structure in nasal function. Although Sheen8 originally described the placement of spreader grafts via an endonasal approach, in contemporary practice, they are perhaps more frequently placed through open rhinoplasty. Proponents of the open rhinoplasty adduce the advantages of improved exposure and visualization and increased precision in graft placement. Spreader grafts placed in this manner are almost uniformly secured with sutures. Studies have demonstrated the efficacy of spreader grafts placed through either of these approaches. However, open rhinoplasty does have several distinct disadvantages compared with an endonasal approach, which includes the concomitant increase in postoperative edema and recovery time and the risk of a visible transcolumellar scar. Figure 5. Patient with left nasal valve collapse and reported nasal obstruction preoperatively (A) and postoperatively after endonasal placement of left spreader graft (B). As demonstrated by the patients in this study group, when given the choice between an inconspicuous transcolumellar scar and no scar, not surprisingly, most individuals (74% in this cohort) preferred the no scar (endonasal) approach. Despite great efforts to perfect the design and technique of the transcolumellar incision, this scar is nevertheless just that–a scar–and, as such, cannot equal the absence of a scar in terms of cosmesis. Further, although a transcolumellar incision will heal beautifully and discreetly in fair-skinned individuals with thin skin, in patients with thick, dark, and sebaceous skin, the potential for an unfavorable cosmetic result is increased greatly. This potential, coupled with cultural attitudes toward cosmetic surgery, partially explains the greater bias toward endonasal publications in Asian countries in which patients expect aminimum of recovery time with no visible external incisions. Although the internal nasal anatomy of Asian noses also differs from other ethnicities, we did not detect a significant difference in functional results between groups. This may be partially explained, from a mechanical standpoint, by the universal effect that spreader grafts have to improve nasal airflow by increasing cross-sectional area and resistance to nasal valve collapse. Some have even posited that separating the ULC from the septum may have the deleterious effect of destabilizing the nasal valve and ultimately is unnecessary in the successful placement of a spreader graft to increase the valve angle and cross-sectional area.11 Although the technical ease of such an operation is appealing, from a practical standpoint, the separation of the ULC from the septum is often necessitated in dorsal hump reduction, a not-infrequent adjunct during nasal surgery.12 In addition, we believe that without separation of the ULC from the septum, grafts may conceivably be displaced inferoposteriorly to their ideal position in the apex of the nasal valve secondary to the intrinsic collapse of the ULC along the dorsal septum. Releasing this attachment has 2 distinct advantages. First, the spreader graft is able to more fully support and lateralize the ULC because the natural inward recoil of the cartilage is no longer present. The second advantage relates to the concept of the nasal passage as a Starling resistor, wherein flow limitation is encountered owing to wall collapse with increasing flow. In this situation, total flow can be increased by either of 2 avenues: increasing the cross-sectional area or increasing the stiffness of the collapsible wall. Nasal valves reconstructed successfully with spreader grafts probably have both of these areas addressed to varying degrees. With regard to the concept of increasing the stiffness of the valve, releasing the ULC from the septum, with its attendant scarring, may generate more stiffening vs a more conservative approach. As previously described, spreader grafts serve multiple functional and cosmetic purposes. This study focused on patients in whom spreader grafts were indicated for functional airway correction. The form that follows this function cannot be understated because the resultant middle-third widening that occurs with spreader graft placement is something that most patients will notice. The patients in this study were counseled preoperatively regarding this expectation, and 41 (100%) expressed satisfaction in their appearance after surgery. The endonasal approach to placement of spreader grafts for nasal valve reconstruction is effective at relieving nasal obstruction due to internal nasal valve dysfunction. Paramount to the success of the procedure is appropriate patient selection, which involves correctly identifying the cause of nasal obstruction, and careful attention to surgical technique. Bridger GP. Physiology of the nasal valve. Arch Otolaryngol. 1970;92(6):543-553. Cottle MH. The structure and function of the nasal vestibule. AMA Arch Otolaryngol. 1955;62(2):173-181. Hurst WB. Internal nasal implant to correct nasal valve obstruction. J Laryngol Otol. 1978;92(1):47-50. Haight JS, Cole P. The site and function of the nasal valve. Laryngoscope. 1983; 93(1):49-55. Kern EB,WangTD. Nasal valve surgery. In: Daniel RK, Regnault P, GoldwynRM,eds. Aesthetic Plastic Surgery: Rhinoplasty. Boston, MA: Little, Brown; 1993:613-630. Shaida AM, Kenyon GS. The nasal valves: changes in anatomy and physiology in normal subjects. Rhinology. 2000;38(1):7-12. Grymer LF. Reduction rhinoplasty and nasal patency: change in the crosssectional area of the nose evaluated by acoustic rhinometry. Laryngoscope. 1995; 105(4, pt 1):429-431. Sheen JH. 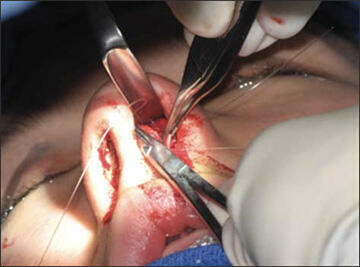 Spreader graft: a method of reconstructing the roof of the middle nasal vault following rhinoplasty. Plast Reconstr Surg. 1984;73(2):230-239. Pontius AT, Williams EF III. Endonasal placement of spreader grafts in rhinoplasty. Ear Nose Throat J. 2005;84(3):135-136. Toriumi DM, Josen J, Weinberger M, Tardy ME Jr. Use of alar batten grafts for correction of nasal valve collapse. Arch Otolaryngol Head Neck Surg. 1997; 123(8):802-808. Schlosser RJ, Park SS. Surgery for the dysfunctional nasal valve: cadaveric analysis and clinical outcomes. Arch Facial Plast Surg. 1999;1(2):105-110. Andre’ RF, Paun SH, Vuyk HD. Endonasal spreader graft placement as treatment for internal nasal valve insufficiency: no need to divide the upper lateral cartilages from the septum. Arch Facial Plast Surg. 2004;6(1):36-40.